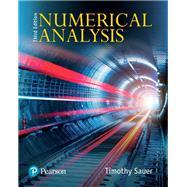 For courses in Numerical Analysis. Numerical Analysis, 3rd Edition is for students of engineering, science, mathematics, and computer science who have completed elementary calculus and matrix algebra. It covers both standard topics and some of the more advanced numerical methods used by computational scientists and engineers, while remaining readable and relevant for undergraduates. Sauer discusses the fundamental concepts of numerical analysis: convergence, complexity, conditioning, compression, and orthogonality. Throughout, Spotlight features comment on each of these concepts as they are addressed, and make connections to other expressions of the same principle elsewhere in the book. The popular Reality Check in each chapter gives concrete, relevant examples of the way numerical methods lead to solutions of important scienti c and technological problems; they can be used to launch individual or team projects. MATLAB® is used throughout to demonstrate and implement numerical methods. Timothy Sauer earned his Ph.D. in mathematics at the University of California–Berkeley in 1982, and is currently a professor at George Mason University. He has published articles on a wide range of topics in applied mathematics, including dynamical systems, computational mathematics, and mathematical biology.